Originally my plan for my first YR Mod. But when I got the idea of Colony Wars. It got overshadowed. Finally got motivated again to finish this. Noodles Patch is a mod that aims to add or modify most minimally to the best of my best abilities. An Ares Mod that aims to provide minimal additions to the Game that will also provide balance and fix/update graphics & audio as well. This Mod is mainly aimed at for Multiplayer & uses Ares to enhance the game. - Technician now has its own unique graphics. - Fixed a coloring error on the Snow Version of the Snow Hospital. - Allied & Soviet Ore Refineries now use an unused Sound. - Ore Drills on Maps now use an unused sound. - Virus Death now has Shadows. - Yuri Walls Cameo has been fixed to fit in only one bar. - Technicians are now the Building survivor instead of Engineer for all sides. They function like Engineers but do not have a Defuse Kit and instead have a Pistol. - Grizzly Tank strength increased from 300 to 400. - Allied Amphibious Transport now has Heavy Armor. - Allied Amphibious Transport can now crush infantry and has same threat rating as Soviet & Yuri Transports. - Patriot Missiles can now attack paratroopers. - Rhino Tank strength increased from 400 to 500. - Flak Tracks and Sea Scorpions can now fire on the move. - Crazy Ivans can now gain veterancy. Elite Weapon uses an unused Ivan Explosion. - Flak Cannons can now attack paratroopers. - Tesla Tank Bolts can now pass through walls. - Lasher Tank Weapon damage decreased to 65. - Lasher Tank Price decreased from 700 to 600. 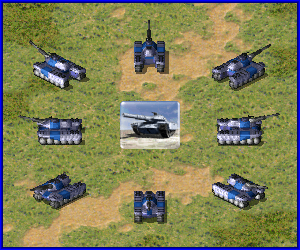 - Gatling Tanks can now fire on the move. Okay then I'm restarting this up again, I need help picking up some other balance tweaks or bug hunting from the vanilla game. This is based on the UMP Inis so any other help on finding other bugs will be appreciated. This is based on Ares so there is some leeway between adding/tweaking new units. I can acquire some play testers for the balance. Namely top players. I'm not sure why you'd make the Allied amphib alone crush infantry. Any particular reason? They were unable to crush infantry in the original and had lighter armor and lower threat rating (Making them less likely to be attacked). The Soviet & Yuri ones already had the ability. I just made it so they all have essentially the same stats. Missing Attack Voice for Siege Chopper Cannon Mode. While i'm still on the works for this... What do you guys think of on removing text on Cameos? (Everyone puts Tooltips on Yes anyway) and adding AlternateTheater on the chrono commando. Here's the patch so far. You'll need at least the latest Ares Patch. - All Construction Yards are now buildable, Requires Service Depots (Or Grinder) + Construction Yard to be built. - If you have extra 100 Power you can deploy it to increase shroud range. - Unless armed with Twin Barrels, Most Units have had their Elite Weapons doubled and as opposed to having increased Burst. Using Ares before it is bugfree is a bad idea imo. Especially as long as such crucial features like savegame support are broken in Ares. A solution might be a stripped down online-only game without any movies support, a menu that instantly goes into lobby etc, so you can keep using Ares. But then it's no UMP but only an online gaming RA mod. Wasn't the original UMP designed to fix all kind of critical bugs and graphical stuff, with optional balancing changes? Yeah this was the aim for it. But yeah I didn't know what to call it at the time. My original plan back then was to make a simple Ares-based Multiplayer Mod for YR and enhancing it with Ares. Surely just downloading UMP and using most stable Ares build achieves same effect. So yeah extremely misleading name. A more suitable name would be Jem Rules. Any adjustments which tweak any unit parameter should be considered optional implementation. Ares in this case of this patch would fix exe issues which cannot be resolved by coding alone e.g. guard exploit on miners. 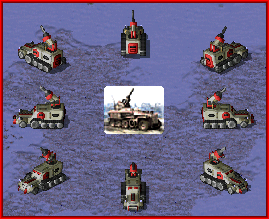 I'm mainly adding the missing ability of the Tesla Tank to EMP Units. 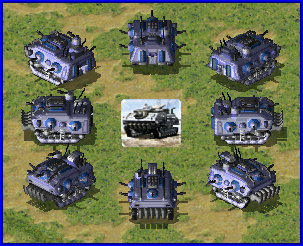 (Which was written in its Loading Screen) or adding new equivalent units to balance out each side. And probably only adding units that would balanced out.. I've made a Spreadsheet of the Unit Roster for it. Added a tweaked IFV Combos Section as well. Have to say Jem, this does seem like a complete mod on it's own. I like the concept tho. It reminds me to CannisRules. Uggh yeah its just so hard to not touch the Basic Unit roster whenever I open up an ini file. I've redone the list now, this is the smallest way I can go around to truly "Hard Editing" the Game without diverging too far. TBH I liked that setup. It seemed like a good runner-up to CW 'til you gather the ant buildings. Italicized Units are either New Units,Unique Units or Units in question from being added. Just updated this again. I'll be posting the link for the updated mix so far in this Post later on. Removed all the new voxels. For now they are all using vanilla voxels except for the Yuri Hover Transport which atm is a recolored/retextured version of the Soviet one. As my new approach for Noodles Patch is to retexture or in some special cases remake the Vanilla Voxels. Yuri Clone & Yuri Primes now gain experience and at elite have increased range. Yuri Prime can control up to 3 units. Floating Disks cannot drain Defenses anymore. Slave Miner moved to Battle Lab Tier. Boomer's Torpedoes now deal 10 more damage but fires slower than the Typhoon. Typhoon now fires in bursts of 2 (No damage changes) and now have their own unique MoveSound instead of using the Giant Squid's Sounds. Battle Fortress Strength increased from 600 to 1000. Mastermind Strength increased from 500 to 800. Added OpenTopped/Gunfire Animations for Tesla Weapons,Chrono Legionnaire Weapons & Desolator Weapons as well as a new one for the Initiate. The old one is now used specifically for Mind Control Infantry & Units. Added Snow Theater Specific Art for the Chrono Commando and also enabled an unused Attack Animation for him when he attacks with his C4. Chrono Miner,Chrono Ivan,Chrono Legionnaire & Chrono Commando now make a zipline effect when teleporting. Rocketeers now instantly face the direction of their target and have better movement. Slave Miner moved to Battle Lab Tier. ? I do not get it. Do you have additional miner as standard miner or what? Added MadHQ's Refinery in. Temporarily Yuri can build War Miners until I finish the voxel for his new Miner. Ah, that makes sense. Good work. I disagree with the proposed change of the Floating Disk price. 1750 is just fine for such a powerful unit. It can kite effectively in groups and shuts down entire bases. Not to mention disabling individual defenses and draining funds. And oneshots infantry in many cases. But yeah as Orac mentioned... a Squad of Disks will still vaporize a group eventually. Chaos Drones now have 2 modes of attack. It can fire the Chaos Gas a short distance (6 Range) or can be ordered to deploy much like its original weapon. And I've given the weapon a red glow via Bright & CombatLighting. Thats true, but unless you have Apaches or enhanced Siege chopper in the way. Regarding disk laser. Reember that it has one huge disadvantage. That is charging lasers. So you have a group of infantry and group if discs. Discs wont shot as Rockeeters/Siege choppers/anything with machine gun to reap infantry quickly. They need to charge up laser, meaning that in most cases, whole group need to charge u lasers, but only one will shoot at soldier if he is about to die from one shot (has less than 70% health), meaning that only one can shoot, and whole group charged lasers for no reason (because they targeted same soldier), and they need to recharge again before next shoot. So in such cases, which happens often, they just waste time by loosing shoots because of that recharge (but they have ROF 80 which is high for such unit). So actually that is good that you decreased its ROF when elite. I've always found that annoying. Sorry for late reply. How'd you do this? And, by "better movement" I assume you mean that they don't do that stupid thing where they bob around for a few seconds when given an attack order? They attack like the Jumpjet Troopers now. Where they fire on the unit until it goes out of their range then follows it and repeat the process. But overall you won't get the flying around in circles just to acquire the taget part anymore. Just change "JumpJetTurnRate" to "JumpjetTurnRate" Westwood typo ztype up like the debris. I'm including all my SHP Fixes/Enhancements so far. Good changes. Keep doing that. I demand you to give me screenies on the visual thingies that you have fixed. Search for NAINDP_B in the YR Mixes. Its an unused animation on the Industrial Plant where lights blinking in order similar to the one seen on the Soviet War Factory. Well done Jem. Keep it up. I hope more updates will come on your Noodles patch. Well your patch is great but mind if I adopt a few of your changes to mine also? I might start making patches too. The new changes I've been adding to Noodles Patch are just mainly SHP fixes and standard fixes anyway. all the files that will be in Noodles Patch will be Open to everyone. Dude where's the download link? Not sure if you found this already Atomic_Noodles, but I noticed that the "JumpJetAccel=" flag also has its second J wrongly capitalized; "JumpjetAccel=" is the correct notation according to the flag's entry on ModEnc. Yeah and it's better not to restore that one. It sounds like a perfectly fine tag, why not? Higher values for acceleration screw up jumpjet behaviour. 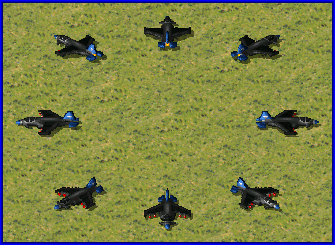 Infantry like Rocketeers have problems firing, transports can't land and so on. The values present on all jumpjet units in YR are high enough to cause these issues. The fallback value in JumpjetControls is 2, Rocketeer's value (that is not read due to that typo) is 10, for an example. Collectrons will also be available in Noodles Patch as well as Colony Wars. In Noodles Patch however they will only have the ability to be amphibious and move faster. Also added a Snow Bridge Hut as I noticed it when DarkRose made his own take on a Bridge Hut. Most Infantry will die in 2-3 shots. Comes with new weapon sound, you'll have to figure out how to add it yourself. Black Eagle Voxel retexture/touch up. Bumping this to ask if this mod is still being developed or dumped for Colony Wars, as I was looking forward to the small additions and lots of QOL changes, etc.